(#WorkloadWednesday) Unlike my coworker Bill, who completes several items on his to-do list before I brush my teeth, I am not an early morning riser. Up at 5:00 with coffee in hand, by 6:30, he will have almost completed a WordPress social media post before my feet first hit the ground. After completing his gym routine by 8:00, he drops his kids off at school and, finally, his real fun begins with networking, social media outreach, finding images, researching, editing and more writing. Typically, Bill and I talk shop for a couple hours around noon. My morning is somewhat different, mostly due to the different hats I wear. After a mad-dash getting my kids to school by 8:00, I crunch numbers and track our Google Analytics data in the morning; by mid-afternoon, my creative juices start flowing, just when Bill needs a nap. Given the differences in our day as well as our writing styles, we need measurement tools to gauge if the use of our time and our social media focus is both correctly set and profitable. A question we frequently need to address is: How many times should we post per week? Ultimately, the answer to this question and the success of our blogging efforts is based on the “numbers”. We focus our social media efforts on creating and sharing interesting, educational content. We want our readers to improve their social media efforts and complete their social media tasks in less time. It should come as no surprise that our tagline is, “Tips to be great at social media in just minutes per day”. How often you should blog post, varies based on audience response, conversion and your ability to provide useful and provocative content. After creating our blog posts, we spend considerable time testing by measuring and evaluating the success and failures from our blog efforts. From this, we can determine our blogging sweet spot. To solve for the “Blogging” variable, an important rule is to TEST. Test to see how many times per week or month is ideal for your social media audience. 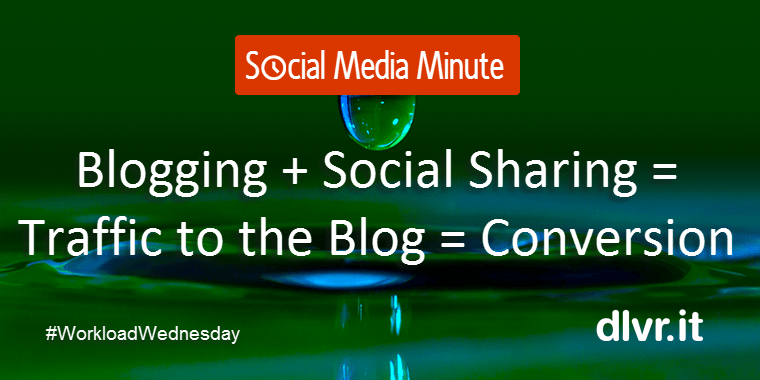 Test what posting length resonates with your audience. Test what types of content are preferred. What can our blog traffic tell us? How many times should we post each week? The ideal number of posts is still a work in progress. We are currently posting four times per week. We see a 25% lift when we post more than twice per week. Over time, we want to see this lift increase and we’ll determine whether or not it justifies the time and expense of creating new content. By tracking the variances, we can easily see what content is resonating with our audience and what falls short. We noticed our “how to” posts outperformed our “productivity tips” posts by 70%, leading us to change the mix of our posts: 3:1. When is the ideal time to post? We noticed our blog traffic spikes on Monday morning and continues to rise throughout the week. We also noticed our blog traffic is significantly flat on the weekend – no need to post then. What can traffic from our blog to our site tell us? By tracking the increase in conversions, we can easily see if our blog posting strategy is working. We noticed a 100% increase in conversions when we increased our blog posts from one to two posts per month to two or more posts per week. From our blog referral traffic, we can use the referral path to determine what content is generating goal completions. We noticed, our “how to”, “productivity tips” and “evergreen content” posts were the top conversions leading us to continue with our current posting strategy and content mix. What is your blogging sweet spot (the minimum number of posts needed every month to keep your blog on an upward trajectory) and how do you determine this?